← How to collect autographs… mostly Star Trek & how I beat the odds! Fifty years ago today on 22nd November 1963, President Kennedy was assassinated whilst driving in an open top car as part of a motorcade in Dallas, Texas. It’s a crime that still grips much of a nation if not much of the world. Everyone who was alive at the time remembers where they were when they heard the news and most people like me who came afterwards has seen the same old news reels time after time. Why is it though that after 50 years, it is an event that is still so widely remembered and talked about? Partly of course it is that he died so young. He was the President in the early 1960’s at a time that when the United States was at its most confident and powerful and led the world in popular culture and in the fight against Communism. Though the Cold War overshadowed the world, the West was going through a huge wave of liberalism with mini-skirts, civil rights, free love and new music. President Kennedy was part of this new wave of optimism, he was charismatic, young and photogenic just like his wife. Famous personalities who die young are always remembered as we always wonder what they might have achieved if they had gone on to live. Many of them might have faded away long ago but it is hard not to wonder what sort of back catalogue someone like John Lennon might have had if he too had not been shot. His father was Joseph P. Kennedy, a controversial American ambassador in London who sought meetings with Adolf Hitler in the lead up to WW2 and even London was being attacked. It is said he tried to keep the United States out of the war and was Anti-Semitic. Whenever possible Joseph Kennedy would leave London when the bombs came leading one British government member to remark that he thought that his daffodils were yellow until he met Joe Kennedy. Joe Kennedy often acted without authority from Washington and it didn’t take long before the realisation set in that he wasn’t the right man for the job which ended his dreams of becoming President himself. His son John though was altogether more adroit and had a keen political mind. As a young man he wrote a celebrated Treatise on the lead up to war between Britain and Germany which celebrated the appeasement policy of the 1930’s. It was this keen mind and fact that he was the first president of the USA born in the 20th Century that led to his popularity but his independent thinking as demonstrated by his father caused suspicion by some that he had a possible determination to enact policies against some of the vested interests in his country. If we are to believe the conspiracy theorists, there are many reasons why Kennedy may have been killed by the authorities. He had shown interest in disbanding the CIA and withdraw troops from Vietnam. Kennedy also investigated reforming Wall Street and the Federal Reserve, close oil industry tax breaks and clamp down on the untaxed assets of American multinational organisations overseas. An added reason why JFK is still remembered is due to the various suspicions about his death. Three quarters of Americans don’t believe the official accounts of his death or at least believe there are key facts being hidden away. Many of the basics of his death aren’t even agreed upon. First of all it isn’t even agreed how many shots were fired or where they came from. Over 40 people have given evidence that they saw shows fired from the famous grassy knoll and not where Lee Harvey Oswald supposedly fired from. Secondly the video footage itself seems to imply that the President was shot from a different angle that official reports suggest. It is said there was a large exit wound at the back of his head that was patched up in the hospital. Bizarrely, his brain went missing. Lee Harvey Oswald was castigated in photos showing him posing with a snipers rifle. However he insisted these photos weren’t real but were doctored. Indeed different published copies of these photos show manipulation has happened, one way or the other. To make things more confusing, the original autopsy report was deliberately destroyed although one of the doctors present at the report insists the copied file is accurate. Even the official autopsy photos are not the actual ones taken, so says photograph developer Sandra Spencer who processed the original film. It is alleged that the CIA already had a relationship with Lee Harvey Oswald, the man charged with the murder of John F. Kennedy or as Senator Richard Schweiker put it, the CIA had their fingerprints all over Oswald. Some believe Oswald had links with Russia and or Cuba and that they were involved in the assassination. Sadly many relevant files are not yet released leaving only speculation such as what I’m writing here. The shooter of JFK was himself murdered just days later. We might have found out a lot more but Lee Harvey Oswald was himself shot while in police custody by nightclub owner Jack Ruby. It is said by some that he wad close links to the FBI and the police and that he killed Oswald as part of the same plot that killed the president. The first rule of assassination is always to kill the assassin. 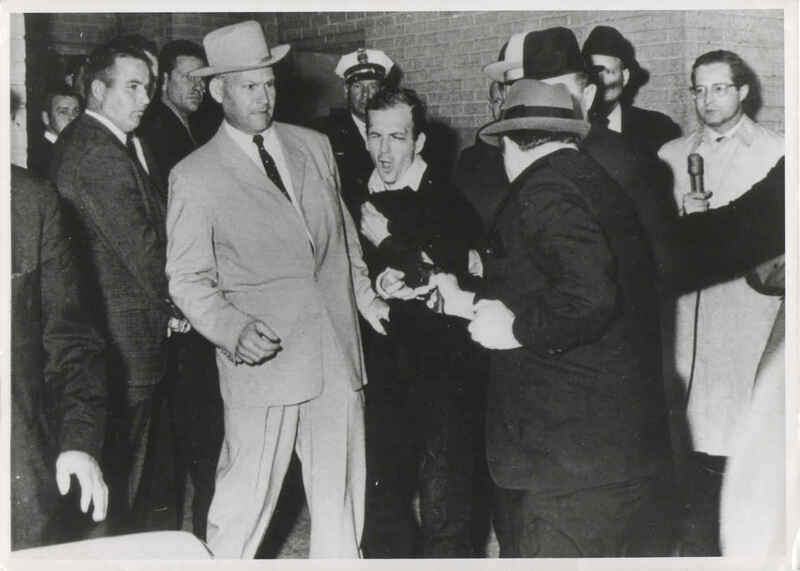 Jack Ruby was convicted of the murder of Oswald but facing the Death Penalty successfully petitioned for a re-trial. Whilst he was awaiting re-trial, Jack Ruby died from a secondary illness caused by lung cancer. Ruby always insisted that there were people in very high places involved in the death of President Kennedy who them used him as an easy scapegoat. He repeatedly asked that he be allowed to leave his prison to give evidence as he didn’t feel safe there and is said to have told Dallas Deputy Sheriff Al Maddox that he was given an injection that caused his cancer. 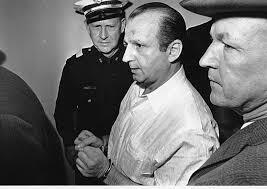 Jack Ruby in police custody. Convicted of murdering Lee Harvey Oswald but adamant he was part of a much bigger plot. The only person whose death comes close to that of Kennedy is that of Lady Diana. Beautiful and hugely popular the world over and mother to the future King, she died in a road accident in a Paris tunnel just days before she was expected to announce her engagement to a Muslim whose father is disliked by the establishment and who was seemingly ready to emigrate to raise her children abroad and possible in a different faith. 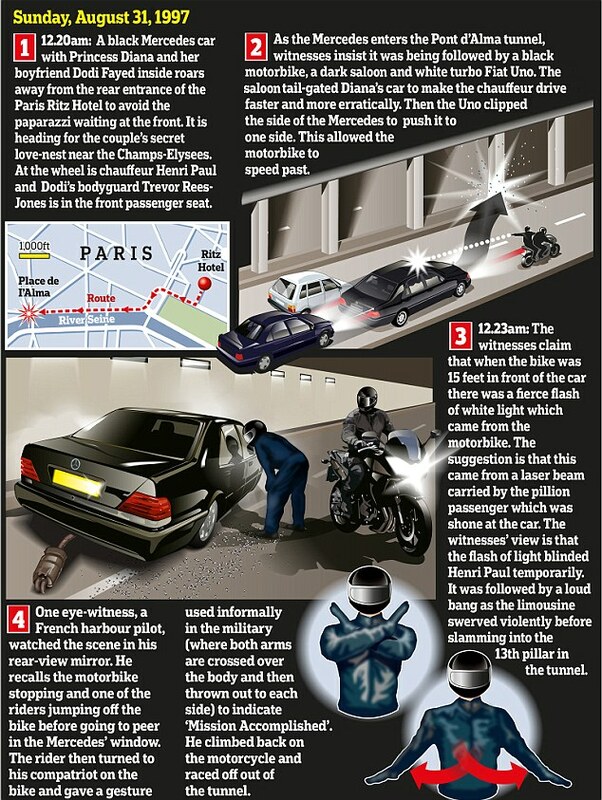 Like the death of Kennedy, many people don’t believe the official accounts of her death and there has been much talk and reports of a mysterious pair of bikers who blinded the driver and after the crash quickly ran over to the car and seeing that the occupants were dead or dying performed a military signal to his colleague before riding off. Rumours would have you believe they were part of British secret service or SAS operation ordered by the very top of the establishment. Despite the best efforts of French police these bikers and their bike have never been identified and they in no way look like the other French paparazzi. Did a rogue SAS pair cause the death of Princess Diana? Until the secret papers are released in 2017, rumours will continue about the events on and around the 22nd November 1963 and even if one day all the fact are agreed upon it is hard now to wonder what Kennedy might have achieved had he enjoyed the longer term in office he most surely would have won. Today, flags are being flown at half mast at government buildings across the USA and at memorials around the country and here in the U.K. a service has just finished at Runnymede. 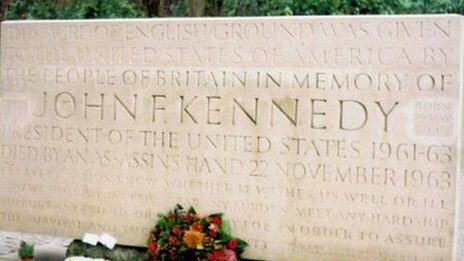 A wreath has been placed at the memorial to President John F. Kennedy at Runnymede in England. This entry was posted in history and tagged Assassination, Conspiracy Theory, history, Jack Ruby, JFK, John F. Kennedy, Lee Harvey Oswald, Life, President Kennedy, Princess Diana. Bookmark the permalink. 5 Responses to 50 years today John F. Kennedy was assassinated but do we know the whole truth? many Soviet people were crying when they heard about it. He was loved and respected after the Cuban crisis. That’s really interesting to learn. I remember seeing how the people of Berlin were all cheering Chamberlain when he went to Berlin to try and stop WW2 much to the fury of Hitler. 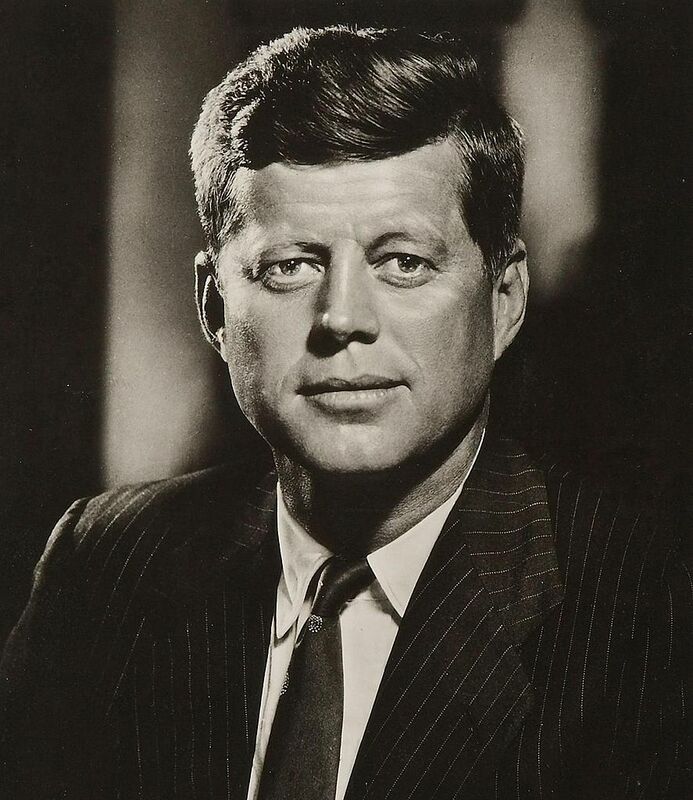 President Kennedy played the whole Cuban missile crisis really well and his strong handling of the Cold War set the tone for the next few decades. It’s incredible that people in Russia realised this too. Interesting post. There are some serious mysteries to the Kennedy assassination, and whoever planned it was amazingly lucky to get away with it, as there seems to have been some crossfiring going on, which would have put quite a few in danger. As you say, it is speculation all of it, but some factors are very powerful – including the route itself – whoever had the power to redirect it certainly had the power to organise an assassination. The choice of car, also is a factor, and that umbrella is just too suspect. The removal of bricks containing bullet holes was key to hindering the investigation – losing the bricks more than a minor annoyance. But the cover up has been a huge job,even though guys like Hoover were unpleasant enough to do the covering. But I don’y buy that Princes Diana was assassinated! A wonderful post as ever. 2017 you say? What’s the betting that something goes wrong or that whatever is released is heavily redacted? Thanks! Yes, I agree with you. Come 2017, we will know little more than today. If and it is quite a big if somehow either the CIA or other branch of the American government was involved, they can hardly come clean now as it would cause political and social chaos, maybe even a break of the Union if the brightest Democratic President of the century was deliberately murdered.